Raquel Luxury Plush Mattress by Beautyrest Black. Queen Size. Pocketed Coils and Memory Foam. 10 Year Warranty. Made in America. The Queen Size Raquel Luxury Plush Mattress by Beautyrest Black. Discover your ultimate comfort zone with the advanced pocketed coil technology along with the multiple layers of cooling memory foam. You'll love the pressure relief and the individualized back support as well! Includes a 10 year warranty. Made in America. The SurfaceCool Plus Fiber is design to have an innovative fiber material just beneath the fabric that's designed to move heat away from the surface of the mattress to help maintain an ideal sleeping temperature. The Tencel fibers are vertically integrated to create easy airflow channels for maximum breathability and temperature control. A soft open cell foam delivers high airflow helping to keep you cool and comfortable during sleep. This ventilated memory foam has a unique feel and helps provide conforming back support and increased airflow for an ideal temperature. This Simmons exclusive foam creates a comfortable firm feeling while allowing airflow to channel throughout. Designed to provide enhanced comfortability and pressure relief, with individualized back support for each unique shape. The Nanocoils are one of the newest innovations to maintain high levels of support and comfort. The Advanced Pocketed Coil Technology is not available in any other Simmons line and is used exclusively for the Simmons Beautyrest Black line. These patented triple-stranded coils help deliver "our best" comforting back support. This design will give you a better nights sleep by preventing motion transfer. The Advanced Pocketed Coils will conform to your curves and when you change positions only the coils that support you will adjust - the rest of the mattress will remain undisturbed. Simmons Beautyrest has been helping people find a better night's sleep since 1900. The Simmons Signature Beautyrest Mattress was first produced in 1925 with pocketed coils. In the 1950s the mattress company introduced the king and queen size mattress. 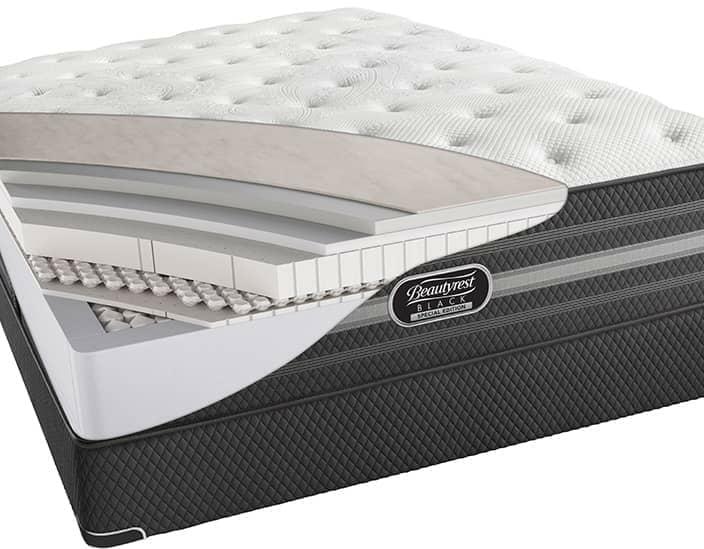 In 2018 Simmons Beautyrest combined memory foam and pocketed coil springs to produce a mattress line that would showcase their improved mattress technology and relentless drive to produce a mattress that provides a better sleep that you can count on. Simmons Beautyrest mattresses are designed and assembled in the USA and use only the finest materials. Home Furniture Plus Bedding has a huge selection of Simmons Beautyrest mattresses. Visit any of our 8 Mattress Center store locations in Baton Rouge LA, New Iberia LA, Lafayette LA, Lake Charles LA, Nederland TX and Beaumont TX.